Buddhism is not officially recognized as a religion in Slovakia. The 2001 census findings included Buddhism under «other religions, » so the total number of Buddhists is not known. Various Buddhist schools, including all three traditional vehicles (Hinayana, Mahayana and Vajrayana), are active as either informal groups or civil associations. Theravada is represented by groups of vipassana practitioners. Several Zen schools, including disciples of Roshi Kaizen and the Korean Kwan Um School, represent the Mahayana. 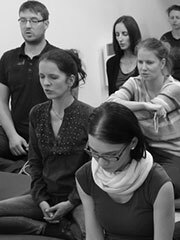 Vajrayana schools include Nyingma practitioners following Namkai Norbu Rinpoche and Diamondway Buddhism under the spiritual guidance of H.H Gyalwa Karmapa Trinley Thaye Dorje, founded and directed by Lama Ole Nydahl.The majority of Buddhists in Slovakia practice Diamondway Buddhism, part of the Karma Kagyu lineage.